The group opposing the medical marijuana ballot measure in Utah sought ongoing support from Gov. 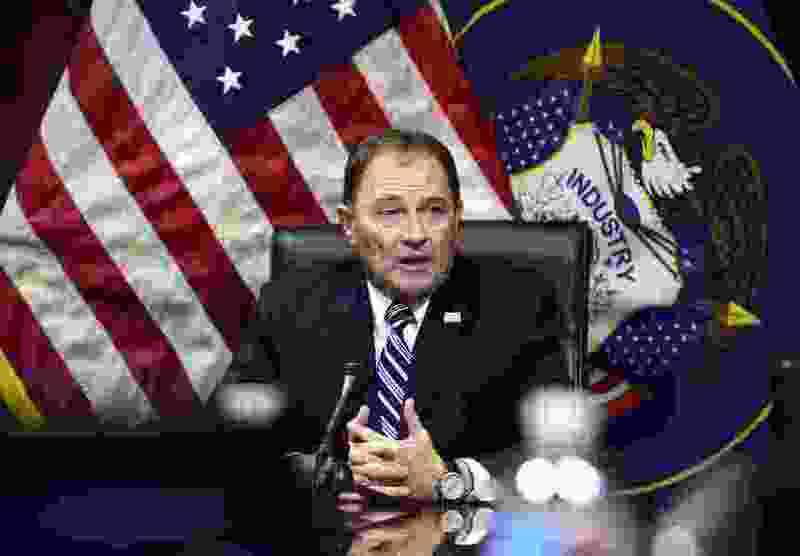 Gary Herbert, his campaign team and the state’s executive branch agencies, The Salt Lake Tribune has learned. And Herbert, who has announced his opposition to the initiative, said he turned them down. According to emails reviewed by The Tribune, the group wanted access to Herbert’s email list to send messages opposing Proposition 2, which would allow Utahns to possess and use marijuana to treat an array of medical conditions despite its federally illegal status. It also sought fundraising help through the governor’s donor lists. Representatives from the group, known as Drug Safe Utah, wanted Herbert to provide supportive statements from agencies in the executive branch, a request the governor’s staff says he found “a little concerning” and denied because those agencies would be tasked with regulating the initiative if voters approve it in November. One email, sent by an attorney who serves as the chairman of the LDS Church’s public affairs council in the Salt Lake City area, provides some insight into the strategy. James S. Jardine, who has served in several positions for The Church of Jesus Christ of Latter-day Saints, said he is not fighting Prop 2 on behalf of his faith. When The Tribune asked the LDS Church about Jardine’s involvement, a spokesman said it “was probably best for Jim to speak for himself on this." Jardine isn’t an attorney on the lawsuit filed last week that argues members of the LDS Church would be forced to ignore their religious beliefs under the initiative, which would prevent landowners from denying renters who are medical marijuana cardholders. But he is working with Drug Safe Utah, which to this point has been financed primarily by attorney Walter J. Plumb and the Utah Medical Association. 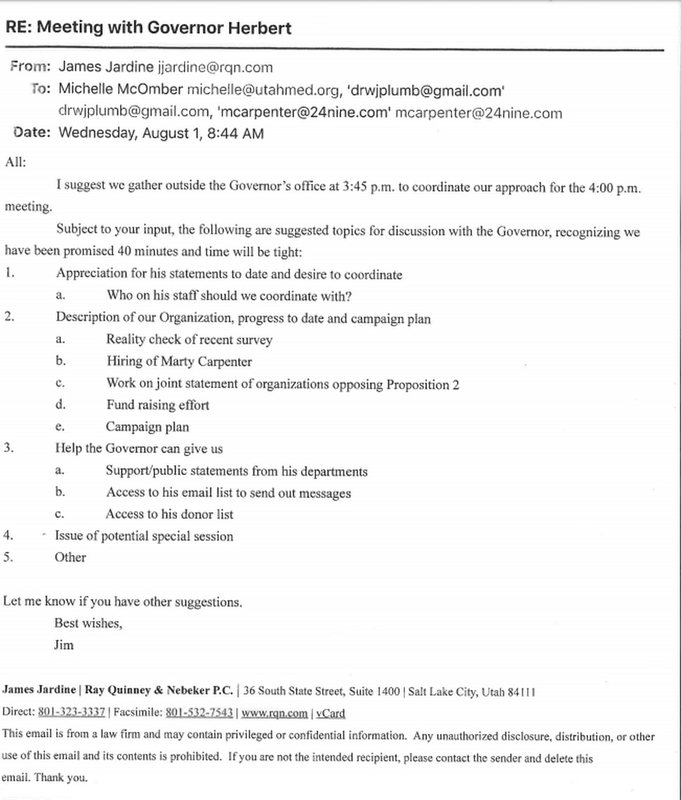 The Aug. 1 emails, provided to The Tribune by initiative supporters, were between Jardine, Plumb and Michelle McOmber, CEO of the Utah Medical Association. They also included Marty Carpenter, Herbert’s former spokesman and campaign manager. They mentioned hiring Carpenter for the campaign. Carpenter, who now runs his own political consulting firm, 24NINE, said he never joined Drug Safe Utah. Plumb wrote in the emails that businessman and philanthropist Kem Gardner would be joining, and Gardner confirmed he was “giving and raising money to fight” the ballot measure. Plumb, whose publicly reported donations make up the bulk of money received from Drug Safe Utah, said he had met with the governor once or twice to talk about the measure but that he couldn’t recall an Aug. 1 meeting. The emails discussed “help the governor can give us." That help could include “access to his donor list,” “access to his email list to send out messages,” and support and public statements from his departments. They also referred to the “issue of a potential special session.” As governor, Herbert could call legislators into session to address any topic — as he did in July. It wouldn’t be right for the governor to work with a campaign against a ballot measure, argued former state Sen. Steve Urquhart, a supporter of the medical marijuana initiative. Jardine said the group isn’t coordinating with Herbert or his agencies, that it didn’t get access to the governor’s donor list and that, “to my knowledge,” it didn’t get access to Herbert’s email list. Paul Edwards, Herbert’s spokesman, confirmed the meeting took place but said the governor hasn’t offered to help the campaign against Prop 2. He also said the governor has no plans to call a special session before November’s election. Edwards also said Herbert has directed government departments to avoid taking any position on any ballot measure. Unless the lawsuit is successful at blocking the ballot measure, voters will decide in November whether to expand marijuana access in Utah for patients with conditions such as chronic pain, epilepsy and post-traumatic stress disorder. In anticipation of the measure, the Legislature voted to legalize marijuana for patients whose doctors expect will die within six months. Email from James S. Jardine about meeting with Gov. Gary Herbert about Utah's medical marijuana ballot measure.